My partner, Giovanni Castellucci, and I have been placing dental implants in our periodontal practice for over 27 years. In the early days, the Branemark “hybrid” prosthesis was the standard of care for restoration of fully edentulous patients with five or six implant fixtures. We followed the traditional two-stage protocol and our patients enjoyed tremendously successful outcomes which have improved their quality of life. However, as time progressed, the hybrid prosthesis became less popular as more conventional PFM fixed restorations were fabricated on custom abutments. 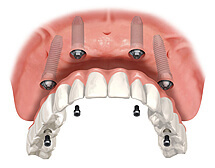 In recent years, we have seen a resurgence of the use of the hybrid prosthesis with the “All-On-4” Immediate Dental Implant (Teeth in a Day) protocol. Now, we successfully restore fully edentulous arches on four implant fixtures on the same day that the hopeless teeth are removed, oftentimes without the need for bone grafts. Our patients are thrilled with the results, and the functional and esthetic benefits are instant. When speaking with many of our restorative colleagues in Boston, Newton, Framingham, and the Metrowest communities, I occasionally hear them say “my practice doesn’t have edentulous patients“, or “we don’t make dentures”. This would imply that the demographic profile of these practices does not include a major component of the general population. Yet, we know that millions (if not billions) of dollars are spent annually on denture adhesives, and that the national dental clinics that focus on denture fabrication are thriving. And, let us not forget that many people with hopeless teeth due to severe gum disease or decay oftentimes avoid treatment because of fear of having to wear a complete removable denture. The “All-On-4” treatment is the perfect solution for these patients as they can have their natural teeth replaced by non-removable, fixed implant-supported teeth on the same day in one dental appointment. In our practice, we see “All-On-4” patients from all communities, even the most affluent. After all, dental and periodontal diseases do not discern one community from another. With this in mind, we urge all clinicians to “open their eyes” to the benefits of immediate dental implant restorations as another tool to help enhance the lives of our patients. Have any of you had similar experiences? Please share them with the community.